When we think about uses for artificial intelligence and automation, we often think forward to super-intelligent machines replacing humans. I think that’s ambitious. I think we’ll get there, I just think the next wave isn’t pure AI (artificial intelligence). If you want discuss opportunities, we need to discuss a different AI — and that’s augmented intelligence. Humans will be improved by, but not necessarily replaced by, machines in the next wave. And, that’s going to be great. 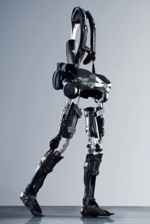 Similar to how exoskeletons will enhance human strength in the physical world across a lot of use cases. Much of the interesting software being built in the next decade will be “exoskeletons for the mind”. Much of the interesting software being built in the next decade will be “exoskeletons for the mind”. I was fortunate enough the meet Garry Kasparaov, the chess grandmaster and attend an event he was involved in. He mentioned that while machines could now beat humans at chess, the strongest competitor is the combination of human and machine working together. Sound familiar? Augmented intelligence. It’s here, it’s just not widely distributed, yet. We will use exoskeletons to move the physical load from our muscles to the exoskeleton — allowing the physical load to move from human to machine. Augmented intelligence will move the cognitive load from human to machine. I look at augmented intelligence as a mix of technologies to create both intelligent machines, but also insanely simple user experiences. So, my design philosophy centers around three words: Intelligent, Ambient, and Automated. Intelligent: Use artificial intelligence (or any other set of algorithms) to get the job done, and get smarter. The key is to create feedback loops and improve over time based on feedback. Ambient: Create software that is an intelligent layer over what the human is already trying to accomplish. It should be integrated into the environment as much as possible and assist the human when and where the human needs it. It should assist humans with the lowest amount of user experience friction possible. Automation: Create software that removes cognitive load from humansand moves the load to machines. At Cognifyd, we’re an augmented intelligence company in the pure sense. Our mission is to move cognitive load from humans to machines, and we’re starting with online communication, something that people spend 1/3 of their time doing at work. We’ll be helping write business communication for all employees — allowing the signal to cut through the noise and creating more efficiency. It’s time to take one of the things we do a lot of — write communications at work — and augment it. We’ll make it more efficient and more effective. Humans can communicate. Machines can communicate with humans (see chatbots). The best path to pursue (based on the maturity of the technology) is creating machines that augment humans while they are communicating. Just like chess. It looks like Cognifyd. We launched our editor today. Sign up on our site for access to our free business proofreading editor. Stay tuned. We have a lot of surprises in store. And, pay attention to augmented intelligence. We’re just one of many future augmented intelligence companies.